What is Manufacturers of The Future? 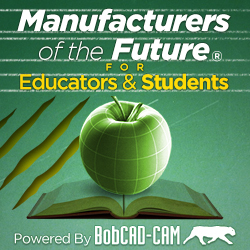 The manufacturers of The Future program is the largest educational program for schools and educators that teach CAD/CAM software in the world! 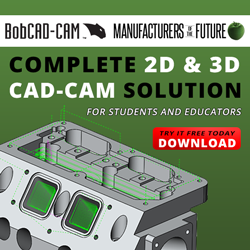 BobCAD-CAM, Inc. launched the program in 2014 to provide schools and teachers with the computer aided design & manufacturing systems they needed in order to successfully teach CNC programming technology to students that want to be a part of the future of manufacturing. Our Education Specialist is connecting with schools and educators throughout the country to educate them on how the program will benefit their schools and ultimately, their students. In addition, we wanted to provide solutions to military men and women from all branches of the Armed Forces that are seeking careers in manufacturing and need solutions. Read Press Releases HERE. The Manufacturers of The Future program is for schools and teachers while the Student Work-Ready program has been created for students to enter their new manufacturing workforce with the software they need to be successful.